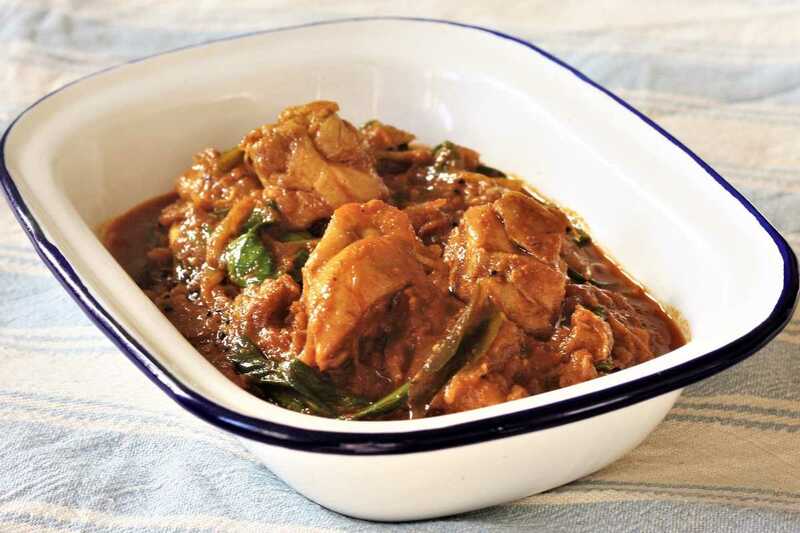 Of all the curries in the world, the Vindaloo is probably the most misunderstood. It’s notorious for being extremely hot and spicy, yet a genuine vindaloo is nothing near as spicy as its reputation would suggest, as I discovered when I visited Goa; the former Portuguese colony in India that is the Vindaloo’s home. I sampled several local versions of the famous curry there, and expecting my head to be blown off with heat and spice, I was actually pleasantly surprised; these Vindaloos were only moderately spicy, but strong with garlic and also had a distinctive vinegary tang. Vinegar is the key ingredient in a Vindaloo, and it’s possibly the cause of the Vindaloo’s fearsome reputation. Accidentally adding too much vinegar, and a little too much cayenne pepper, and you’ll have a concoction so eye-wateringly powerful that it’s probably not very enjoyable to eat. Madhur Jaffrey’s recipe for Vindaloo calls for duck, which is a break from tradition; the classic was typically made with pork. I have opted for chicken, and the result is excellent. This is adapted from Madhur’s recipe, although the underlying technique is hers. Afterall, she is the master of Indian cooking. Personally, I like to enjoy this with nothing more than some plain white basmati rice, although some sautéed green vegetable such as kale or chard, will go alongside nicely. Put a large, heavy based pan on a medium-high heat and add the rapeseed oil. Wait for the oil to heat up. Season the chicken thighs generously all over with salt, then fry in the pan, on both sides, until golden. Remove, and set aside. While the chicken is browning, measure out the turmeric, cumin, coriander, paprika, cayenne pepper and garam masala and set aside in a bowl. Ideally, your pan will be big enough to cook the rest of the curry in it; if not, transfer all the fat from the pan into a larger one. Set the pan over a medium-high heat and add the mustard and fenugreek seeds. When the mustard seeds begin to pop, add the onions and curry leaves. Stir and fry until the onions turn a light golden brown. Add the ginger and garlic, and stir until fully mixed. Now add the spice mixture and tomatoes. Turn the heat down and continue to cook for around 5 minutes. Cut the browned chicken pieces into approx. 2cm chunks, and add to the pan along with the salt, sugar, vinegar and 270ml water. Bring to the boil, then simmer gently for 20 minutes. Taste the curry and add more salt if necessary. Finally, add the baby spinach and stir until gently wilted. Serve with white rice.